The Mahtomedi Area Green Initiative is a volunteer organization working to reduce the use of nonrenewable resources, produce renewable energy and encourage an enduring community commitment to sustainability. We are currently at work in Dellwood, Grant, Hugo, Lake Elmo, Mahtomedi, Oakdale, Pine Springs, White Bear Lake and Willernie in Minnesota. 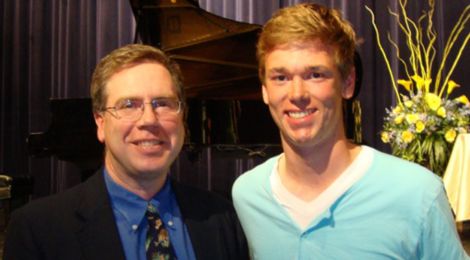 MHS senior Brennan Johnson (r) received the MAGI Environmental Leadership Award from MAGI member Jeff Ledermann. Mahtomedi Area Green Initiative Environmental Leadership Award at the high school’s awards ceremony Wednesday, May 16. The award provides a $1,000 merit-based scholarship to a graduating senior who exemplifies commitment, innovation, and leadership in addressing environmental issues. Scholarship founders Vicki and Si Ford and their family were inspired by Mahtomedi students whose vision, dedication, and leadership were pivotal in making the Zephyr Wind Turbine a reality. Many other community members have added their support to a scholarship celebrating this past student initiative and aims to encourage future student engagement, innovation and post-secondary study in defining and solving environmental problems. Brennan’s commitment to the environment was evident in that he gave up playing soccer his senior year, even though he was an all-conference player and selected captain, to spend a semester away from home to learn about environmental stewardship. His semester at Conserve School in northeastern Wisconsin sparked a fervent passion for the environment, which he has applied to implementing composting projects, promoting nature and outdoor experiences for kids and sharing nature with others through his award-winning photography. Brennan is planning to study environmental humanities at Whitman College. Congratulations, Brennan! Editor’s note: Would you like to help encourage future young environmental leaders? Donations are needed to help ensure that the MAGI Environmental Leadership Award can continue in future years. Make your tax-deductible contribution now! ← Go Out and Play!